Redditor Neilson241 posted a very interesting visual graphic depicting every final score in the history of the NBA, starting in 1946 and ending with the 2016-2017 regular season. 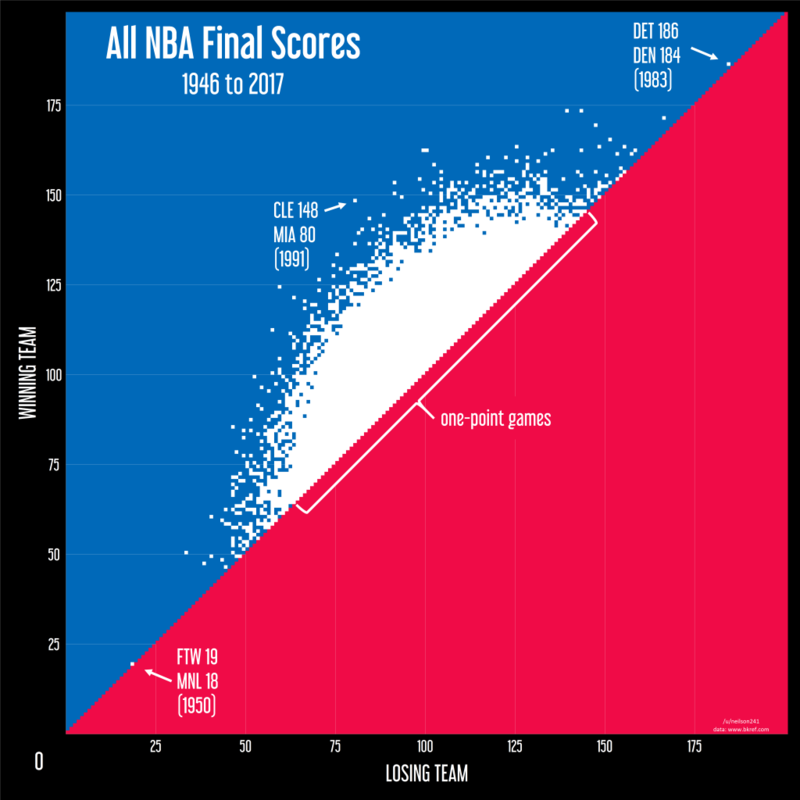 Three games that stand a bit outside the rest of the timeline are the lowest scoring game in NBA history, the highest scoring game and the one with the biggest margin between the two teams. The lowest scoring game in NBA history is back from the day of no shot clock, which explains how the Fort Wayne Pistons and Minneapolis Lakers managed to score a combined 37 points, 19-18 to Fort Wayne. George Mikan scored 15 of the Lakers 18 points. The highest scoring game in NBA history involves to no one’s surprise the 1983-1984 Denver Nuggets, coached by Doug Moe. The Nuggets lost 184-186 to the Detroit Pistons in the game, a 3-overtime affair. The Nuggets played at the time with the 7 seconds or less rule, which meant plenty of high scoring games, and a whole lot of fun for fans. 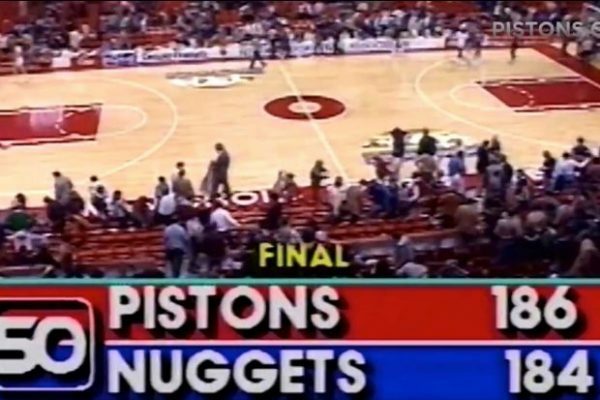 Isiah Thomas led the Pistons with 47 points, followed by 41 from John Long and Kelly Tripucka scoring 35. The Nuggets were led by Kiki Vandeweghe scoring a career high 51 points. Alex English scored 47 points and Dan Issel helped out with 28. Both teams had an offensive rating higher than 124 points per 100 possessions. 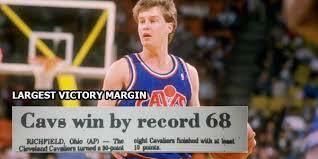 The most one-sided game in NBA history occurred at the beginning of the 1991-1992 season, when one of the best teams in the league, the Cleveland Cavaliers, faced off against the still struggling expansion franchise, the Miami Heat. The Cavs hosted the Heat on December 17, and beat them 148-80. The Cavs’ 145.1 offensive rating was spread all across the depth chart, with 8 players in double figures, no one scoring above 18. Mark Price and John Battle each finished with 18 points, followed by Brad Daugherty and Henry James (not the author) scoring 17. Those Cavs made the conference finals that year, losing to eventual NBA champions Chicago Bulls in 6 games.